This section contains is a pictorial and historical record of each of the suburban cars acquired by the Society for long-term preservation. With the assistance of Society members there may also be the option of obtaining some additional single-deck suburban motor cars and trailers in the future. 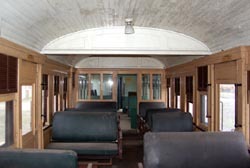 The trailer cars may prove to be particularly valuable as there are only a limited number of trailer cars preserved in comparison to motor cars. This car is one of 101 designed by Dr J.J.C. Bradfield, inspired by cars he observed in operation on the New York subway system during his fact finding tour in 1914. This group of cars, known as "Bradfield" cars for this reason, was the first constructed in Australia to a new design code allowing cars to be constructed to a width of 10'6" in lieu of the then maximum width of 9'. Car C 3082 was built by the Sydney firm of Ritchie Brothers, Auburn, and entered service as car EBB2166 on 27 February 1921 in steam-hauled service on the North Shore line. It was converted for electric operation during April 1928 at the electric car workshops (ELCAR) at Chullora, being fitted with electric motors and driver's controls and renumbered C3082. The car was re-roofed by Tulloch Ltd of Rhodes in 1950. Withdrawn from service at Hornsby on 28 May 1965 it was forwarded to ELCAR Workshops for storage and determination of its fate. C3082 received an overhaul and conversion to the workshop shunter at ELCAR workshops during September 1966 and was renumbered C 3591. This allowed the 1928 steel motor car previously being used in this capacity to be returned to normal service. Shortly before the closure of ELCAR in 1994, the car was replaced as the shunter and stored pending a decision on its future. It had been nominated for preservation in 1992 as it was the last operational example of these cars in near original, serviceable condition. This car was acquired by SETS from RailCorp in 2008. This car was one of fifty all steel vehicles built by the Leeds Forge Company in England and sent to Sydney in a "knocked down" condition, arriving in Sydney during July 1925 with assembly taking place at Clyde Engineering Co. in Sydney's western suburbs. When assembled, it entered steam-hauled service as car number EBB2250 in September 1925. Car EBB2250 was fitted with electrical equipment at ELCAR workshops during April 1926 and renumbered C 3104. 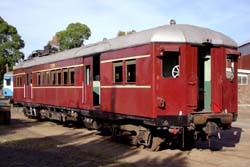 It entered service on the Illawarra line on 27 April 1926, joining sister car C 3103 and four timber-bodied electric cars to form Sydney's second six-car electric train. 440 steel-bodied motor control cars to the same basic design as C 3104 entered service between 1926 and 1929 and were collectively known as "Standard" cars. In addition, car C3102 is retained as part of RailCorp's heritage fleet. C 3104 formed part of a special six-car train commemorating the 50th anniversary of the commencement of electric trains in Sydney on 1 March 1976. 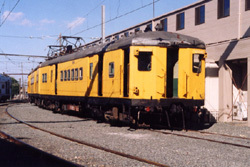 Car C 3104 remained in service until the last day of operation of manual door, single deck electric cars in Sydney on 10 January 1992. The following day, 11 January 1992, SETS organised a special tour around Sydney to farewell these cars, with the set including C 3104, which was the oldest electric car in service at the time, having been in service for over 65 years. Since 1944, C3104 has undergone four major and five minor overhauls. 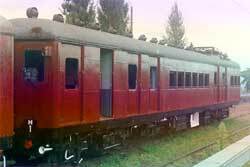 It was sent to Goninan and Co. in Broadmeadow for major overhaul on 24 April 1986. 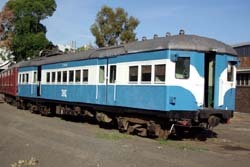 Other cars receiving similar overhauls in that era had their lift-up side windows replaced with Beclawat aluminium framed sliding windows to alleviate rust problems in the window area of these steel cars. Emerging from the major overhaul during October 1987, C3104 retained its original windows due to excellent body condition. This car was acquired by SETS from RailCorp in 2008. A contract was placed with the Clyde Engineering Co. during 1936 for an additional twelve steel-bodied motor cars to alleviate a foreseen shortage of motor cars in service as a result of the early (1920s) motor cars being due for lengthy overhauls. These additional cars entered service between May and July 1937 and were numbered C 3441 - C 3452. They featured side windows smaller in area than the earlier cars and were known as Modified Standard cars. 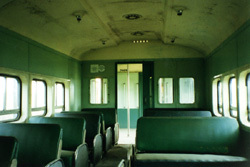 When additional single deck cars of a different design were introduced between 1940 and 1957, they also adopted the smaller windows. C 3444 remains the sole representative of its group. C7489 was built by the now-defunct Tulloch Limited (formerly Tulloch Phoenix Ironworks Ltd.) at Rhodes as part of the post-war contract for 47 motor-cars and 105 trailer-cars, entering service as two-motor car C 3489 on 5 March 1953. In this guise, C3489 received its first "C" (intermediate) overhaul between 31 October and 21 November 1957. The car was involved in a derailment at Penrith and was under repairs between 31 March and 8 April 1959. The car received its first major "F" overhaul at Comeng between 15 September 1970 and 21 July 1971 when it was converted to four motors and renumbered C7489. Its next "C" overhaul took place between 13 April and 8 June 1976 when it was repainted to the Mk.II blue & white livery. C 7489 returned to Comeng for its next "F" overhaul between 23 June 1984 and 16 February 1985 when it was fitted with Beclawat windows and repainted indian red. It received another repaint at Carriage Works during July 1987. C7489 was withdrawn off set M1 at Punchbowl on 23 December 1992 and transferred to Flemington to become yellow shunting unit 3666. The car was withdrawn from service use and moved to the Down Yard at Clyde in January 1997. C7489 was sold by the S.R.A. to the Society for preservation on 9th September 1998. It was moved from Clyde to Meeks Road sidings on the 15th March 1999. 7489 Current status (April 03) - Stored. This car is generally complete but has some damaged high voltage wiring and needs motors on one bogie changed due to damaged motor leads. The car also needs some internal and external corrosion attended to, including reconstruction of all external passenger doors. Patterns for all cast door components have been made to facilitate a production run of these original type doors (to be refitted to all our Tulloch cars). The internal lighting system has also been overhauled. 7489 also needs a full mechanical and electrical inspection and service, and a complete interior and exterior repaint. LEFT: The preservation of C7510 means there is now a Tulloch representative of the "Redfern" overhauls to complement Standard car C3426. C7510 is shown at Flemington Maintenance Centre on the air in its role as shunter 3664 on 1 May 1996, coupled to 3666. Photograph: Geoff Riley. 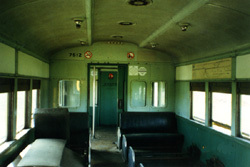 RIGHT: The interior of C7510 shows the effects of months of open storage in Clyde Yards, with the white ceiling discoloured by mildew. Of interest is that, unlike C3426, the ceiling in this car is the original complete with trim, with only the light fittings replaced by fluorescent tubes. Taken on 15 February 1997. Photograph: Charlie Attard. C7510 was also built by Tullochs Limited, entering service as C3510 on 9 February 1954. On that date, C3510 was dispatched to Flemington Car Sheds, before being transferred to Elcar the next day where it remained until 22 December that year. Its first "C" overhaul took place between 14 October and 6 November 1959. Its first major "F" overhaul took place at Comeng between 8 December 1969 and 2 October 1970 where it was converted to four motors and renumbered C7510. Its next "C" overhaul between 30 October 1975 and 9 January 1976 saw C7510 repainted in Mk.II blue & white. 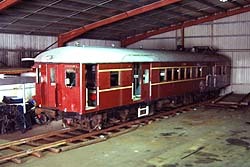 It was repainted indian red at Carriage Works during July, 1987. C7510 returned to Carriage Works for its next "F" overhaul between 2 February and June 1988 when the car was fitted with Beclawat windows and received a rebuilt interior. C7510 was withdrawn from service at Punchbowl C.S. on 23 December 1992 from set M1 and transferred to Flemington C.S. to become yellow shunting unit 3664. The car was withdrawn from service use and moved to the Down Yard at Clyde in January 1997. C7510 was sold by the S.R.A. to the Society for preservation on 9th September 1998. It was moved from Clyde to Cranebrook in August 2000. 7510 Current status (April 03) - Long term stored. This motor car is moderately complete as regards the interior but will require replacement of most underfloor high voltage wiring runs and resistors, and needs motors on one bogie changed due to damaged motor leads. The car also needs some corrosion attended to, including changing of several external passenger doors. As this car was obtained only as a spare, no further works are currently planned and the car is presently held away from the rail network, being used as a store for miscellaneous equipment. 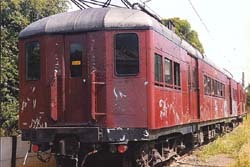 LEFT: Original window motor-car C7512 in its interim indian-red repaint at Meeks Road on Christmas Day, 1999. Photograph: David Kirkland. 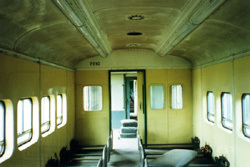 RIGHT: The interior, taken in 1997, shows the signs of neglect since withdrawal from service. Photograph: Charlie Attard. C7512 entered service on 28 April 1955 as two-motor car C3512. The car was dispatched to Flemington C.S. the following day, then transferred to Elcar where it remained until 11 May 1955. C3512 received its first intermediate "C" overhaul between 15 December 1959 and 8 January 1960. Its first major "F" overhaul took place between 3 December 1971 and 15 June 1972 when it was converted to four motors and renumbered C7512. Unlike cars C7489 and C7510, C7512 was never painted blue & white, remaining in tuscan red until its next intermediate "C" overhaul between 21 November 1978 and 6 April 1979 when it was repainted indian red. C7512 received its next indian red repaint at Carriage Works during August 1987. The car was withdrawn from service at Punchbowl C.S. from four-car set M40 on 26 January 1993 and subsequently transferred to Flemington C.S. to become yellow shunting unit 3667, seeing further use until withdrawn and stored during late 1996. C7512 retains its original lift-up windows. After the car was withdrawn from service use it was moved to the Down Yard at Clyde in January 1997. 7512 was sold by the S.R.A. to the Society for preservation on 9th September 1998. It was moved from Clyde to Meeks Road sidings on the 15th March 1999. Like C7512, C7513 was built by Tullochs Ltd of Rhodes, entering service as two motor car C3513 on 12 May 1955. It received its first "C" (intermediate) overhaul between 4 December 1959 and 4 January 1960. C3513 was converted to four-motors and renumbered 7513 at Comeng, Granville between 15 June 1972 and 15 June 1973, and also received a blue & white repaint. It was repainted indian red in its next "C" overhaul between 10 October and 12 December 1980. 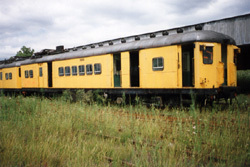 C7513 was withdrawn at Punchbowl from set M1 on 23 December 1992. It was sent to Flemington where it became yellow shunter 3668 on 3 May 1993 until its final withdrawal from this use around 1995. C7513 also retains its original lift up windows. Following this cars early withdrawal from service use, it was sent to Redfern Carriageworks for storage and was held indoors. C7513 was sold by the S.R.A. to the Society for preservation on 11th November 1999. It was moved from Carriage Works to Meeks Road sidings on the 15th January 2000. 7512 Current status (April 03) - Stored. The car is generally complete but has some collision damage to the front of the driver's cab (from an overhead mast) and one roof panel is also damaged. The car also needs some internal and external corrosion attended to, including replacement of all external passenger doors and extensive repairs to window pillers and most lower body panels. The key floor structure needs repairs at two doorways, new topping in the driver's and guard's area and new lino throughout. 7512's switchgear has been removed and given a complete overhaul, involving dismantling, cleaning, replacement of O-rings , relubrication with subsequent reinstallation in the car. The internal lighting system has also been overhauled. Otherwise 7512 needs completion of a full mechanical and electrical inspection and service, and a complete interior and exterior repaint. 7513 Current status (April 03) - Under restoration. This car is generally complete but has some damaged high voltage wiring. It needs a bogie change due to condemned wheels. The car needs some internal and external corrosion attended to, including replacement of all external passenger doors. The floor requires new lino. The internal lighting system has been overhauled. 7513 also needs a full mechanical and electrical inspection and service, and a complete interior and exterior repaint. Additional Walsh Island, Tulloch and Comeng suburban cars were purchased by Society members at, or subsequent to, their sale by public auction on the 24th November 1998, and from Cataract Scout Park. While retained, they are currently not part of the Society's official collection. 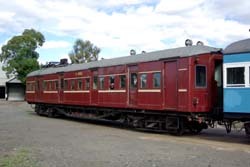 These include motor cars C7465 (1940 Pre-war Tulloch) , C3714 and C3725 (1955 Comeng) and trailer cars T4408 (Walsh Island), T4609 (1950 Post-war Tulloch), T4768 and T4771 (1955 Comeng). These cars are generally complete with bogies and full underfloor equipment etc. and all have original lift-up windows. These cars are currently housed at Cranebrook, Chullora and Molong.